This is a double layered boutique hair bow. 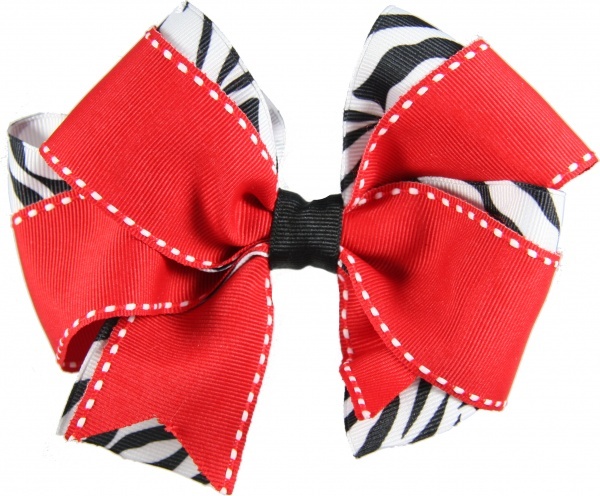 It has a black and white zebra print on the bottom and a red with white moon stitches layered on top. Both ribbons are 1.5 inch wide grosgrain ribbon that are bound together by a black grosgrain ribbon. The red top bow tails are cut at an angle so that the black and white zebra can show through on the bottom. Zebra print is a big hit with the young girls.